I don’t why I’m even sharing today’s Nice Price or Crack Pipe Lincoln with you. I instead should be getting on a plane for a cross-country trip to buy it. Since I’m not, let’s see just exactly what it is that I’m missing. So as we all know, back in the ‘50s, Chevy chose to use the name of a small class of navel vessel—Corvette—for its then new sports car. That raises the question however, of how the warship originally got its name. The Corvette ships were those below Frigate class in size, but above that of what might be considered coastal patrol boats and your dinghy. Fascinating, I know, but perhaps not as intriguing as the possibility of actually owning a Corvette, ship or car. And, seeing as the ship would be extremely hard to park in any city, the better choice would be a car like yesterday’s 1979 Chevy Corvette with 4-speed and a rebuilt (but oddly Ford Blue) 350 V8. Well, maybe not. It seems that while the car only cost a meager $6,500, 51 percent of you found it too rough for those bucks, giving it a frustratingly narrow Crack Pipe loss. I’m not willing to go down with that ship so let’s move on. Have you ever wondered why Lincoln never really got in on the station wagon game? I know I have. Maybe it was because its sister brand, Mercury already had the luxury longroof front covered with cars like the Marquis Colony Park. Especially in late ‘60s guise, that was one of the poshest wagons money could buy. Koo-koo-ka-choo, Mrs. Robinson. More recently, Lincoln has offered the MKT, an oddly shaped high roof that’s about as close to a wagon as they dare create, but outside of the livery market, somehow misses the mark. 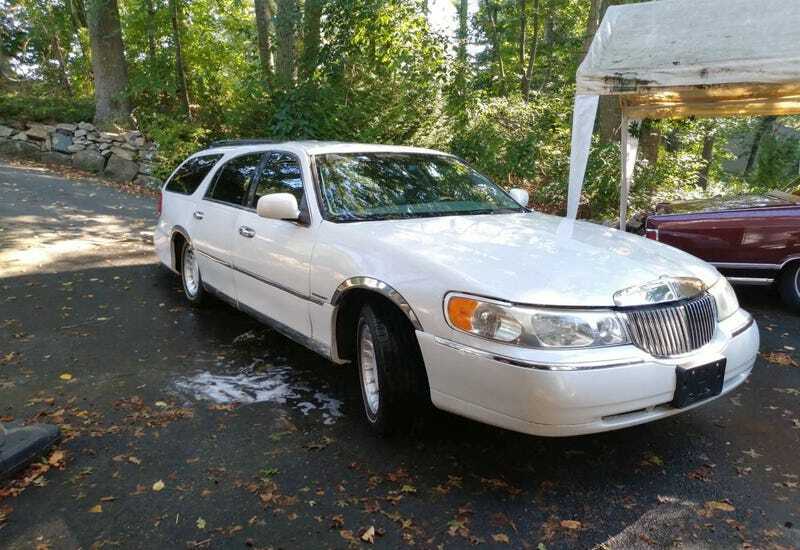 No, what we desperately need is a Town Car with three rows and a roof rack, and about the only way we’re going to get that is with this amazing custom job offered up on Craigslist. It’s pretty stunning in the pictures—like someone just offered to sell you a fully functioning unicorn—and I’ll bet the story behind it is even more interesting. The seller claims that the car was built by a previous owner whose artist wife required a suitable transport for her paintings. Seeing as their Town Car didn’t fit the bill he grafted the back end off of a Chevy Caprice wagon on it and hence became husband of the year. The adaptation of Caprice for Lincoln duty is remarkably seamless. The adoption of F150 step-side tail lamps also seems brilliant, as does the repurposing of the license plate surround into the tailgate. There are three rows inside, the third borrowed from the Chevy donor. It’s not evident that the second row folds down but I’m guessing that it might based on the carpet gap-spanner that sits up against its back as seen in the picture showing the open hatch. That seat, as well as the buckets up front seems to be in fine shape. An aftermarket head unit does its best to look out of place in the ergonomically questionable dash but does comes with Bluetooth. Otherwise, it’s Town Car city in here only baby got back. The odometer says there’s only 65K on the car. Those miles have been provided by way of Ford’s ubiquitous and cheap to maintain 4.6-litre modular V8. Backing that up is a 4-speed automatic with what I imagine is the action of a jar of warm marshmallow fluff. The seller says that when he took ownership of the car it did present a few issues, all of which he has since addressed. Now he claims it to need absolutely nothing other than a new and prideful owner. Okay, this is like winning the lottery, right? I mean, it’s perfection in meta; and a whole lot of plastic. There must be something wrong with this car that has allowed it to even make it to the classifieds without first being snapped up by some covetous and patient neighbor, right? Where is the fly in the ointment, the turd in the punchbowl, that inevitable monkey in the wrench? Yep, you guessed it. The issue with this car lies with its title. Thankfully it’s not a salvage, but it is noted as having a lien against it. What does that mean? The car has been placed as collateral against some loan and will not be disencumbered until that debt is repaid in full. Is that a deal killer? No. I mean, come on it’s a Lincoln Town Car station wagon, and you’d fight a box of angry house cats to have it, amiright? The lien will likely be satisfied by the asking, which is $7,500 and then you’d be in the clear. Then again, that $7,500 price might have been set simply as cover for the lien and not an accurate representation of the car’s value in today’s volatile market. That’s kind of what we’re here to deduce. What’s your take on this magical beast and that $7,500 price? Does that seem like a fair asking for so wonderful a car? Or, do you lean against? Eastern Connecticut Craigslist, or go here if the ad disappears. H/T to Speak of the Deville for the hookup!